VolunteerHouston.org–opportunities with CEC and several of its member organizations, including Buffalo Bayou Partnership, Willow Waterhole Greenspace Conservancy, Mercer Botanic Garden, TWRC Wildlife Center, Memorial Park Conservancy, Nature Discovery Center, Recipe for Success, Armand Bayou Nature Center, BikeHouston, Galveston Bay Foundation, Hermann Park Conservancy, and the Houston Chapter of the Native Prairies Association of Texas. CECHouston.org–Volunteer with CEC! In 2018, dozens of volunteers contributed almost 2000 hours of their time helping with everything from this newsletter to selecting films for our upcoming film festival to board service. Keep an eye out for our upcoming call for volunteers for Earth Day Houston, to be held on Sunday, April 14, 2019, at Discovery Green. Among our favorite calls are inquiries about volunteer opportunities; with a community of almost 150 member organizations, CEC can suggest great volunteer opportunities for everyone. The Wild & Scenic Film Festival On Tour returns to the Bayou City with its unique brand of environmental cinema on January 30 and 31, 2019. Hosted for the fifth straight year by the Citizens’ Environmental Coalition, this ever-popular film fest will be screened once again at the historic River Oaks Theatre, where up to 450 patrons each night will enjoy ten short films each night highlighting the latest environmental issues. We selected films that showcase the links between beauty, environment, adventure, quality of life, and action. CEC is using this festival to tell local environmental stories, highlight the work of our member organizations, and inspire our residents and visitors to make a difference in the environment and quality of life. We are especially excited to show the two local films that were winners of the Wild About Houston Green Film Festival: Little Grouse on the Prairie by Friends of Attwater Prairie Chicken Wildlife Refuge (January 30) and Gregory Lincoln Education Center by Urban Harvest (January 31). The festival tickets are now on sale through Eventbrite. CEC is pleased to welcome the Rice Environmental Analysis Program as one of our newest member organizations. The Rice Environmental Analysis Program is a cross-disciplinary effort to incorporate courses from environmental science, earth science, statistics, chemistry, ecology, and evolutionary biology, mechanical engineering, applied mathematics, chemical engineering, economics, computer science, and sociology. The program is geared to teach students rigorous methods that are needed by industrial and governmental organizations to deal with environmental issues. Graduates are prepared with skills and knowledge valuable to environmental consulting firms, energy production companies, and government agencies. Read more at cechouston.org. From Jan. 24 through Feb. 12, 2019, the Houston-Galveston Area Council is hosting a series of public meetings on its 2045 Regional Transportation Plan. During the meetings, expert transportation panelists will discuss future transportation projects selected from the recent 2018 Call for Projects application process. The panel will also talk about air quality and conformity initiatives and regional resiliency efforts. The public comment period for the “2018 Call for Projects” draft selection opens on Jan. 16, 2019 and closes on Feb. 28, 2019. The Comment period for the draft plan of the 2045 RTP and Transportation Conformity will open on March 19, 2019 and close on April 16, 2019. For more information and a list of the meetings, visit 2045rtp.com. On Jan. 17, 2019, beginning at 6 p.m., the Gulf of Mexico Fishery Management Council will hold a webinar regarding soliciting public comment on Draft Amendment 50 – State Management of Recreational Red Snapper. The Council is considering state management that would provide flexibility to the Gulf states to set the recreational Red Snapper shin season and potentially other management measures. To register for the webinar, visit gulfcouncil.org. On Jan. 17, 2019, from 11:30 a.m.-1 p.m., the Texas Association of Environmental Professionals will hold its monthly luncheon meeting, featuring a presentation called “The Past, Present and Future of Subsidence in Houston Area,” by Michael J. Turco, general manager of the Houston-Galveston and Fort Bend Subsidence Districts. The event will be held at the Cadillac Bar, 1802 Shepherd Drive. For more information, visit taep.memberclicks.net. On Jan. 17, 2019, from 5-7 p.m., Galveston Bay LNG, which proposes to construct a natural gas liquefaction facility and liquefied natural gas (LNG) export terminal in Galveston County along the southwest embankment of the Texas City Ship Channel, will hold an Open House to provide an overview of the project. The event will be held at the Nessler Center, 2010 5th Avenue North, Texas City. For more information, visit galvestonbaylng.com. On Jan. 17, 2019, beginning at 6:45 p.m., the Houston chapter of the Native Plant Society of Texas will hold its monthly meeting featuring a presentation by Dr. Jean Fefer of the Harris County Master Gardeners Association called “Propagation Techniques and the Barriers to Germination.” The meeting will be held at the Houston Arboretum & Nature Center, 4501 Woodway Drive. For more information, visit npsot.org. On Jan. 17, 2019, beginning at 7 p.m., The Woodlands G.R.E.E.N. will sponsor a Going Green Sustainability Lecture, “Solarize The Woodlands,” at the Houston Advanced Research Center (HARC), 8801 Gosling Road. Dori Wolfe, founder of Wolfe Energy and active member of Solarize Houston, will speak on how to bring solar to the area via rooftop solar for homes and businesses. For more information, visit thewoodlandsgreen.org. On Jan. 19, 2019, Houston Audubon will host Family Campfire Night at the Edith L. Moore Nature Sanctuary as part of its 50th Anniversary Year of Celebration. The event will include night hikes, a mini owl prowl, cabin tours, winter bird craft, pond fishing and live animal time, s’mores and tacos. For more information and to register, visit houstonaudubon.org. On Jan. 19, 2019, beginning at 8 a.m., Houston Audubon will lead a monthly bird count and walk at Willow Waterhole, starting at The Meeting Place, 5310 South Willow. Over the years, more than 200 separate species have been identified. For more information, visit the Facebook event. On Jan. 19, 2019, beginning at 9 a.m., the Memorial Park Conservancy, Trees For Houston, and Houston Parks and Recreation Department is offering an opportunity for volunteers to plant more than 800 trees at the Park. Gloves and shovels will be provided. For more information and to register, visit memorialparkconservancy.org. The 2019 Gulf Coast Symposium and Expo, the region’s leading green building conference. will be held May 17, 2019 at Rice University’s Moody Center for the Arts. Submissions are now being sought from presenters from the fields of architecture, landscape architecture, engineering, planning, interior design, government, education, the arts, contracting, energy analysis, and other building-related professions relevant to the conference theme, “CROSSROADS: Inclusive Exchange.” The deadline for submissions is Jan 21, 2019. For more information, visit aiahouston.org. On Jan. 21, 2019, from 8:30 a.m.-1 p.m., UH Energy will launch the Center for Carbon Management in Energy (CCME) and Consortium for Energy Corporate Social Responsibility (CECSR). The event will include a keynote presentation by Dr. Sami Alnuaim, manager of petroleum engineering application services and the current president of the Society of Petroleum Engineers (SPE), followed by a panel discussion. For more information and to register, visit eventbrite.com. On Jan. 22, 2019, the Houston Advanced Research Center (HARC) and the Galveston Bay Estuary Program Invasive Species Working Group (ISWG) will host a webinar presentation by Cheryl Millett, leader of the Heartland Cooperative Invasive Management Area in central Florida. Millet will discuss her experiences working with CISMAs around Florida, as well as lessons learned and advice for starting a new CISMA. Please contact Dr. Erin Kinney at [email protected] or 281-364-6040 for registration information. On Jan. 22, 2019, from 5-6 p.m., the Memorial Park Conservancy will hold one of its “Memorial Park 101” events, focused on the four distinct ecosystems present in Memorial Park. For more information, see the Facebook event. Each year, the prestigious Terry Hershey Bayou Stewardship Awards recognize community members who have demonstrated an outstanding commitment to aiding in the conservation, preservation, restoration and/or advocacy of Houston’s waterways. Nominees can be from the nonprofit, public or private sectors. The recipients will be honored at Bayou Preservation Association’s 2019 Luncheon on May 21, 2019. The deadline for nominations has been extended to Jan. 23, 2019. For more information, visit bayoupreservation.org. On Jan. 23, 2019, the City of Houston’s Green Building Resource Center, 1002 Washington Ave., will host a seminar on the sustainability of the coffee industry. The seminar will feature panelists David Buehrer of Greenway Coffee, Stephanie Thomas of Public Citizen, and Steve Stelzer, GBRC program director. For more information and to register, visit codegreenhouston.org. On Jan. 23, 2019, beginning at 12:30 p.m., Houston Tomorrow will hold a brown-bag discussion on the future of public transit in Houston, featuring Carrin Patman, METRO board chair, and City Councilwoman Amanda Edwards, representing the Houston-Galveston Transportation Policy Council. The event will be held at the Houston-Galveston Area Council offices, 3555 Timmons Lane. Click here for more information. On Jan. 23, 2019, from 6:30-8:30 p.m., the Houston chapter of the Native Prairies Association of Texas will host its annual Seed Cleaning Party at the American Red Cross, 2700 Southwest Freeway. Attendees will clean seeds collected in the fall and put them in packets to be distributed to people willing to grow them out for the Katy Prairie Conservancy’s Great Growout Program. For more information visit houstonprairie.org. On Jan. 24, 2019, from 1:30-3 p.m., the Lone Star Groundwater Conservation District Water Efficiency Network will hold its monthly meeting, featuring a presentation by Jill Boullion, executive direction of The Bayou Land Conservancy. who will provide information about conservation easements, how they are used as a tool for permanent land protection and who uses them, and the benefits land protection provide the community. The event will be held at the LSGCD offices, 655 Conroe Park North Drive, Conroe. For more information, visit lonestargcd.org. On Jan. 24, 2019, the Galveston Bay Foundation will hold its quarterly Membership Meeting, featuring a presentation by advocacy director Scott Jones called “The Coastal Barrier: Galveston Bay Foundation’s Observations, Concerns and Comments.” The presentation will provide the latest information on the U.S. Army Corps of Engineer’s plans to design and build an Upper Texas Coast storm surge coastal barrier (see the GBF’s position statement and key considerations). The event will be held at the United Way Community Resource Center, 50 Waugh, and is open to all. For more information, visit galvbay.org. On Jan. 25, 2019, from 8:30 a.m.-4 p.m., the National Wildlife Foundation will hold a one-day course on monarch biology, ecology, and conservation. Attendees will learn the basics of monarch habitat creation and conservation and leave the course with the knowledge and confidence to engage diverse groups to take action on behalf of the monarch butterfly. The course will be held at Dennis Johnston Park in Spring. For more information and to register, visit nwf.org. On Jan. 25, 2019, from 9 a.m.-4 p.m., The Wildlife Center of Texas is offering an Oiled Wildlife Response Workshop at the Houston SPCA’s Carruth Education Center, 7007 Old Katy Road. The workshop will certify and train people interested in assisting The Wildlife Center of Texas Oiled Wildlife Response Team during a spill. 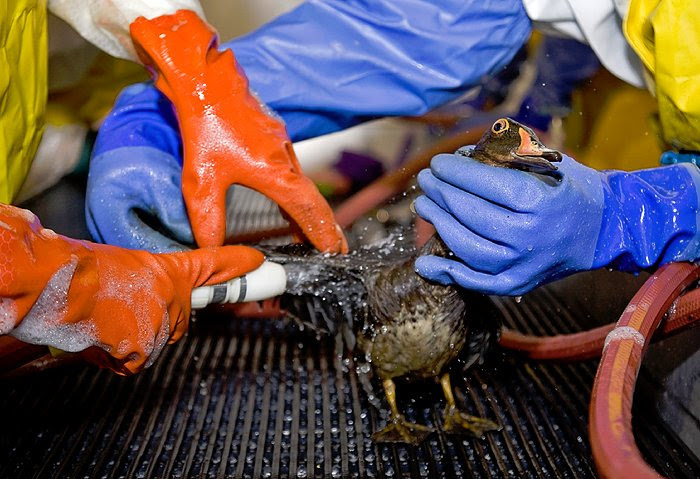 It will cover the effects of oil on wildlife, initial intake and exam of oiled wildlife, an introduction to OSHA training, wildlife rehabilitation’s role in Incident Command System, and actual hands-on cleaning of oiled feathers in which participants will practice by washing an un-oiled white duck. All permitted wildlife rehabilitators and trainees, U.S. Fish and Wildlife Service, state wildlife officials, industry environmental personnel, local veterinarians, veterinarian technicians, as well as interested citizens are invited to participate. RSVP via e-mail to [email protected]wildlifecenteroftexas.org. There is no cost for the workshop, but spaces fill up quickly and seating is limited, so please register as soon as possible. On Jan. 25, 2019, from 6-9 p.m., at Mongoose Versus Cobra, 1011 McGowen Street, Texas Campaign for the Environment and Zero Waste Houston will hold a 2019 kick-off party in preparation for their advocacy in the 2019 Texas Legislative session. The event will feature a concert by the local group Traveler. For more information, visit the Facebook event. On Jan. 26, 2019, from 9 a.m.-1 p.m., Keep Pearland Beautiful will hold an Arbor Day Tree Giveaway at the Stella Roberts Recycling Center, 5800 Magnolia Street. Trees will be native or adaptive to the Pearland area. KPB is encouraging a suggested donation of $10/tree with a two-tree-per-household limit. For more information, visit keeppearlandbeautiful.org. 2/9/19: “Toxic Tour of Houston” with t.e.j.a.s.